Ascariasis is wide-spread infection in developing countries, caused by the roundworm (Ascaris lumbricoides). Although it is uncommon problem in the US, statistics of the Centers for Disease Control and Prevention shows that nearly 807 million to 1.2 billion people have ascariasis. Together with whipworm and hookworm, Ascaris spreads through the soil, which may become contaminated with infected stool of the people. Worm's eggs usually live in the soil, waiting for a new host. If this soil is used as fertilizer, or if you use contaminated fruits, vegetables, water, Ascaris may enter your intestines and settle there. Small children are much more likely to become infected, as they often play in dirty soil, put fingers and toys into the mouths. After you've got eggs, larvae hatch from them in the gut. Then they permeate intestinal tissues, get into the bloodstream and travel into the lungs. During a week parasites mature in the respiratory tract. After that they move into the throat in order to be swallowed. When this goal is reached, the worms grow into adult forms. Female parasite is longer than male worm, and may sometimes become more than 40 centimeters in length. Adult worms stay and reproduce in the intestines, generating up to 200 000 eggs every day. These eggs are removed from your body through the feces into the soil. Many people live with ascariasis, without having any symptoms. Complaints commonly appear, if a person has moderate or large infestations. When larvae spread into the lungs, people often experience pneumonia-like symptoms, such as breathlessness, persistent cough and wheezing. In advanced cases, worms come out of the body with cough or vomiting. 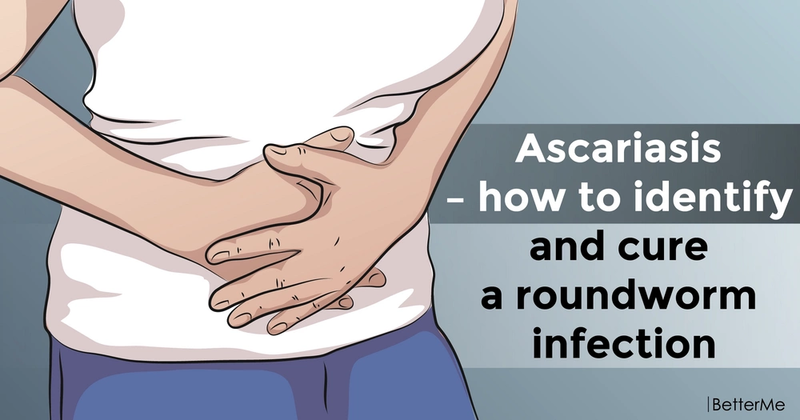 Once Ascaris grow and settle intestines, they may cause abdominal pain, sickness, vomiting, unexplained weight loss, diarrhea with or without bloody stool. In children, ascariasis may lead to delayed growth because of impaired food absorption. If there is too much worms in the gut, they can block a part of the intestines that causes severe cramps and vomiting. Medical professionals use stool and blood tests to find worms and identify body's response to them. Imaging exams (X-rays, ultrasound, CT and MRI) can help find worms in the abdomen. The good news is that this infection can be easily treated by special anti-parasite medicines. It takes from one to three days for albendazole, mebendazole, ivermectin to kill worms. If intestine has already become obstructed by infestations, surgery may be required. However it's much better to prevent infection than to treat it. Filter water before using, don’t forget to clean your hands before taking a meal, wash, peel or cook fruits and veggies to prevent infection. And be sure that your child washes the hands thoroughly and doesn't put them into the mouth, when playing outdoors.